The September 2018 General purpose Police dog course started on Monday 10th September and will run until the 13th of December 2018. From left to right are Chris Carter with Nessa (Previously Elsa) Mark Stevens with Brock, ( Previously Quest ) Martin Prince with Merlin, Course instructor Graham Attwood, and Kevin Roberts with Peppe. The course is without doubt the hardest and most intensive of all Police dog courses. The teams will be trained to track and search for outstanding offenders or vulnerable missing persons, to deal with violent criminals and disorderly crowds, to search for and locate outstanding stolen or lost articles, to chase and detain fleeing criminals and to negotiate all different types of obstacles. 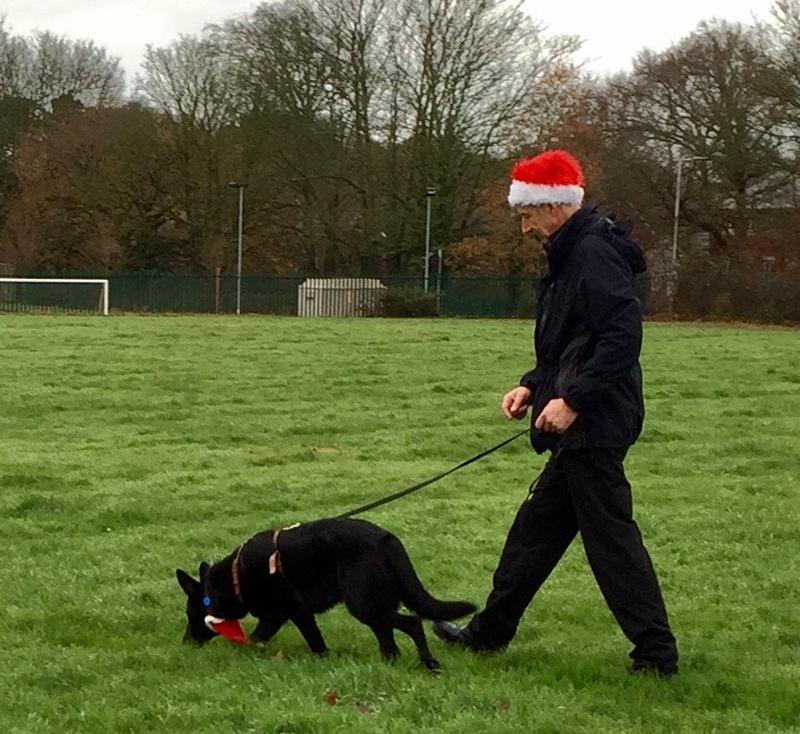 This will all be underpinned with control exercises where the handler has to demonstrate that his/her dog is always fully under his/her control in all circumstances. Let me introduce you to the teams. 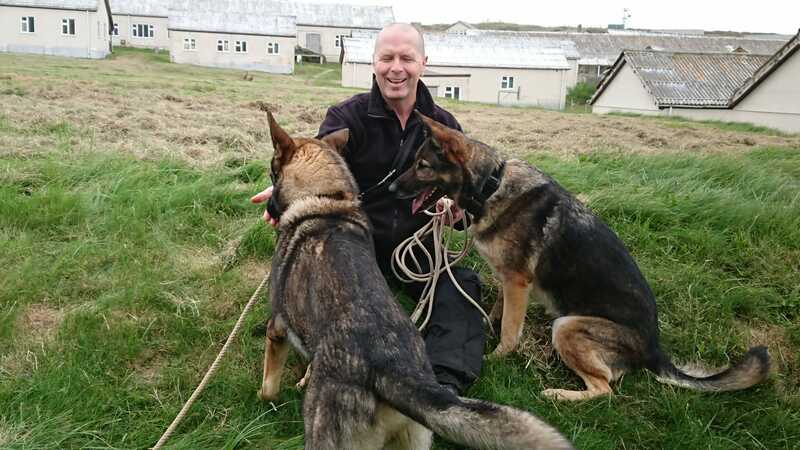 Chris is an experienced handler stationed in North Devon. His current General purpose Police dog Maverick has recently retired after a very successful career. 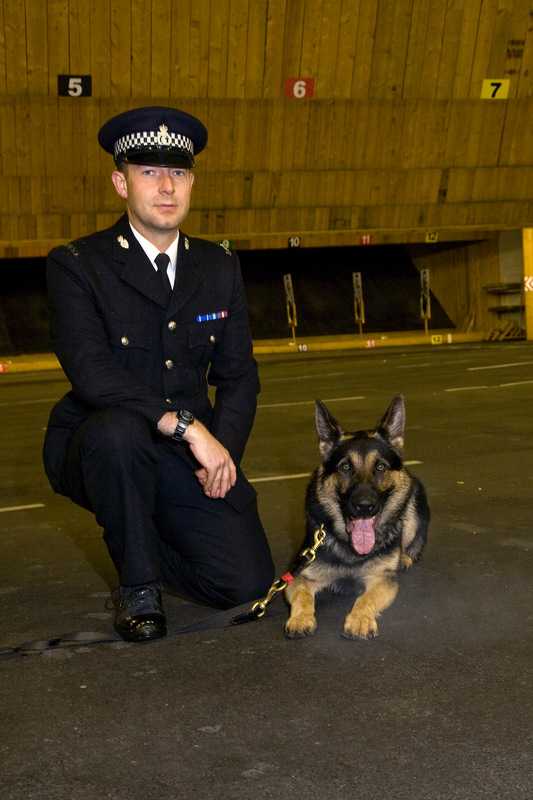 Maverick is pictured here with Chris when they successfully passed their Initial Police dog course approximately 6 years ago. Nessa ( Elsa) joined Chris and his family several months ago and Nessa ( Elsa) is pictured here with Maverick and Chris’s operational Police drug/firearms/cash detection dog Rosie. Chris particularly wanted his next operational General purpose Police dog to be a female because he knew that his retired Police dog Maverick who is a very masculine male probably wouldn’t have got along with another new male. 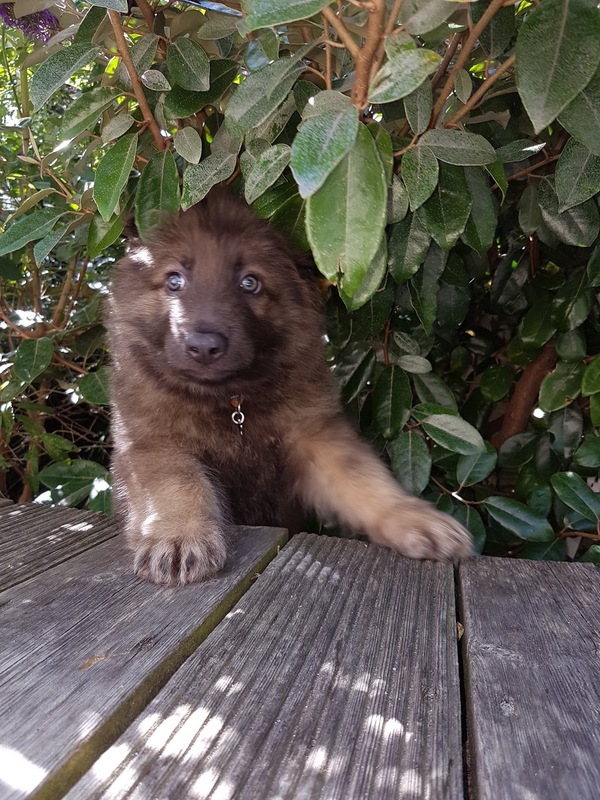 Nessa (Elsa) was bred and provided to us by Bernard Horton of Kazzardsway German Shepherds in Manchester along with her litter brother Eric early last year. Nessa (Elsa ) stayed with me for her first few weeks and is pictured here with my dog at that time Rudy. Steve attended every training day and achieved an excellent standard in terms of her focus work, tracking, article and person searching. Because of her excellent temperament and incredible working ability it was our intention to keep Elsa as a breeding female. We placed Elsa with Chris Walter and his partner Lyndsay who had volunteered to be her permanent carers. Her hips and elbows were x rayed and sent to the British veterinary association for assessment and although her elbows were excellent and her hips were very good they were just not quite good enough for breeding purposes. 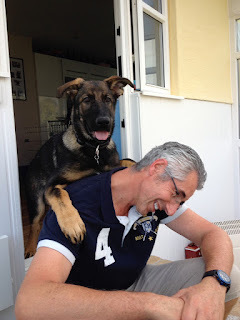 As a result Elsa was then allocated to Chris to be his next General purpose Police dog. Mark is also an experienced handler currently serving at Ashburton dog centre. 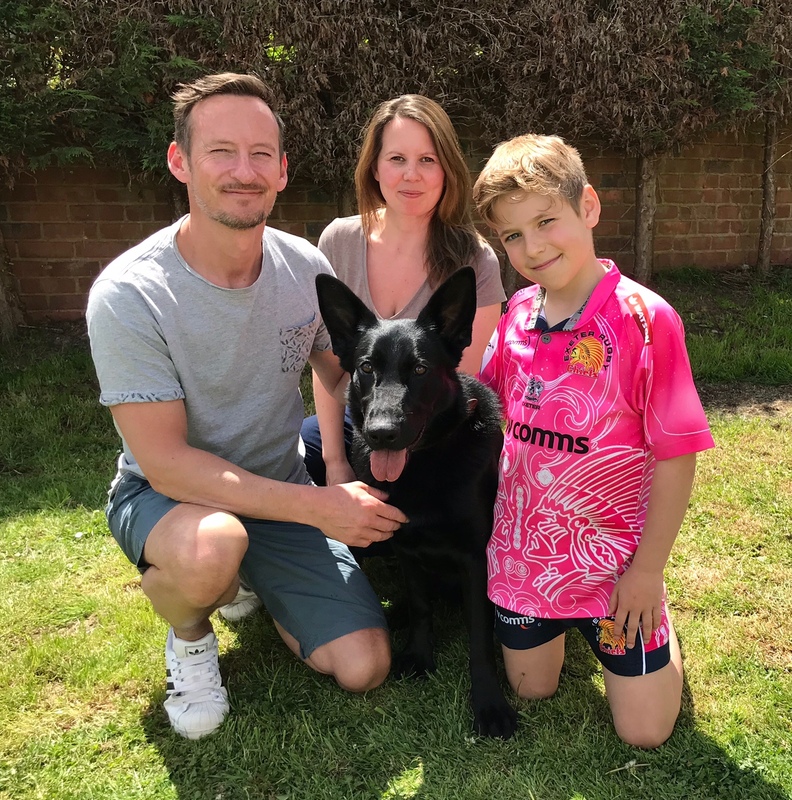 His current Police dog Axel has had to retire prematurely at the age of 5 with a spinal complaint. This has been devastating for Mark because Axel has been one of the most successful dogs in the Alliance. 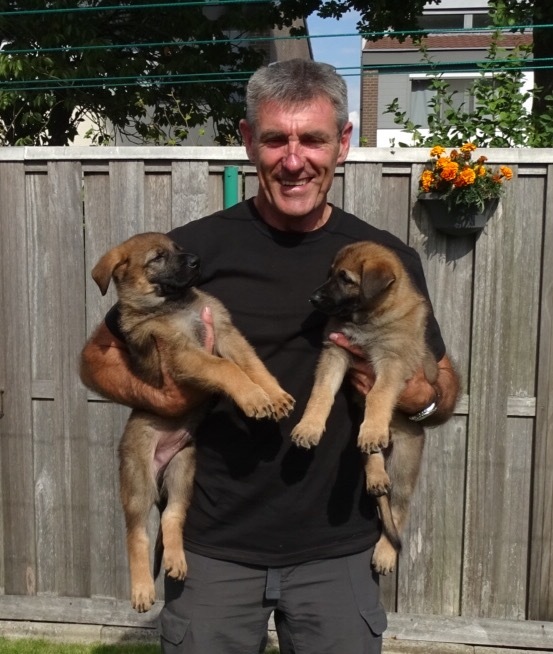 TPD Brock ( Previously Quest) was bred by Walther Verbruggan in Belgium and I selected him along with his sister Quini when they 7 weeks old. I am pictured here with them both in Belgium after selecting them but because of the Rabies laws I couldn’t bring them back to the UK until they were 15 weeks old. Here they both are at my house after I brought them back from Belgium with Brock (Quest) on the right. Brock (Quest) has been puppy walked by Colin and Mitzi Belsher who have successfully puppy walked several pups for the force. 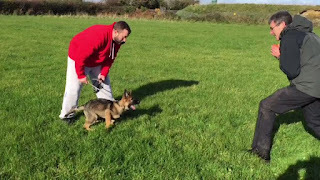 Over the years that Colin and Mitzi have puppy walked they have hardly ever missed a puppy development session. Here is Brock (Quest) doing a down stay at 5 months and also showing his exceptional drive for criminal work. Here is TPD Brock (Quest) getting to know RPD Axel. Mark probably won’t thank me but here is Axel from our A litter on his passing out day in 2014. Here is Axel at the home of his puppy walkers Steve and Maria Pearce as a tiny puppy. Steve and Axel were rarely ever apart. 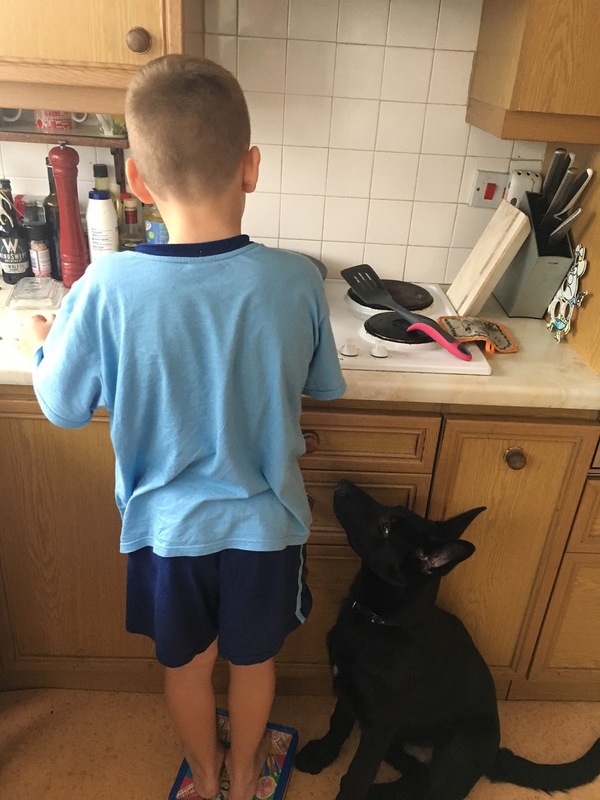 Unfortunately Mark is not going to be able to keep Axel because he is not the type of dog who will adapt to staying at home while Mark is away working with Brock. 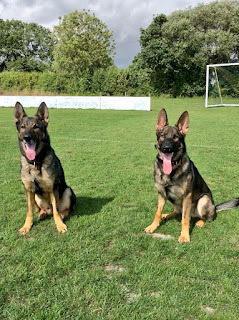 Mark is heartbroken that Axel has had to retire in his prime and has been busy visiting prospective new homes for Axel. 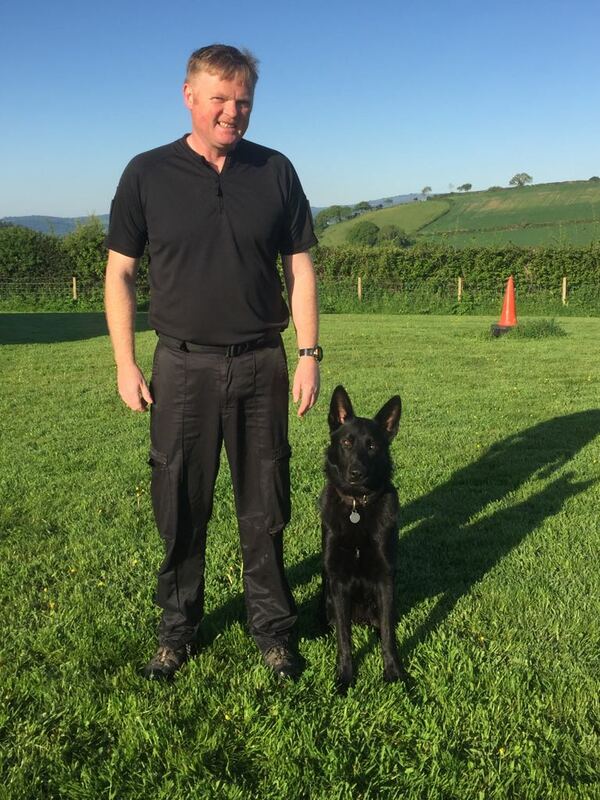 To make matters worse Axel has also been recovering from an operation on his foot at the same time as Mark has been preparing for his course with Brock. This has required regular changes of dressing and applying medication. Obviously Mark hasn’t been able to re-home Axel until he is back to full health. Step forward Steve Pearce Axel’s previous puppy walker who has very kindly volunteered to look after Axel until he is back to full health. Steve was overjoyed to have Axel for this short time and says it was like he had never been away and just like old times. Steve would like to keep Axel but he works away a lot and can’t look after him. 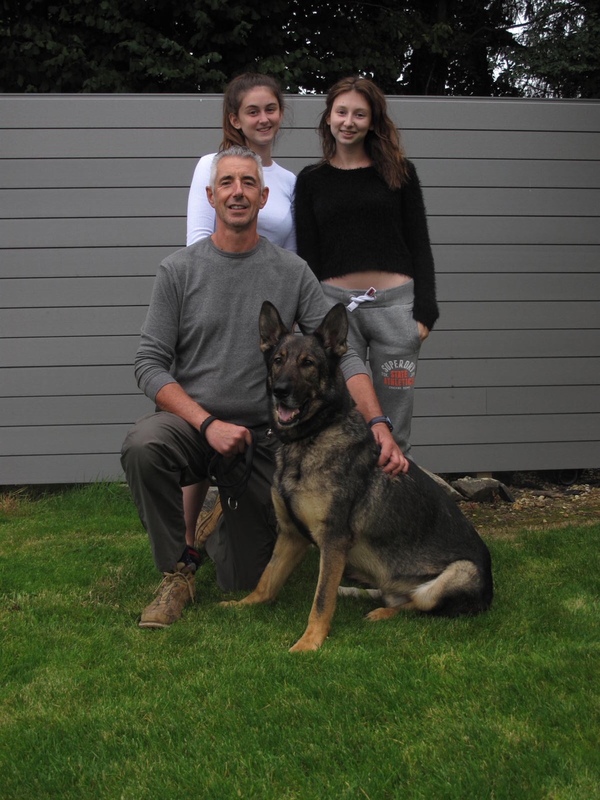 Here is Axel reunited with Steve and his daughters Laura and Grace. Fortunately Mark has found the perfect home for Axel with Ron Forrest and his wife Rachael who live near Exeter airport. 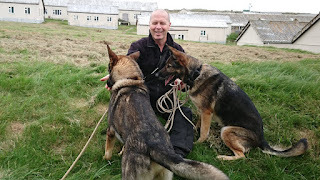 Here they are with Axel when Mark went to meet them. Ron has extensive experience with working dogs and previously provided a home for another Police dog called Czar who had to retire early due to an injury received on duty. 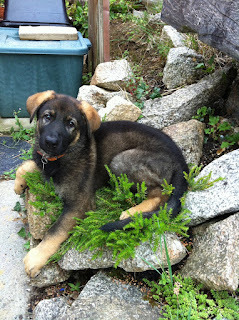 It is hoped that Axel will be joining Ron and Rachael on or around the 23rd of September. Martin is a Police officer in Dorset with 10 years’ experience. 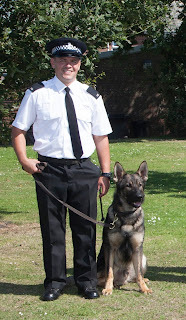 He is a first time handler and if successful with Merlin will be stationed in Ferndown Dorset. Merlin was bred by Ian Morgan of Lorokmor working dogs in Shropshire. 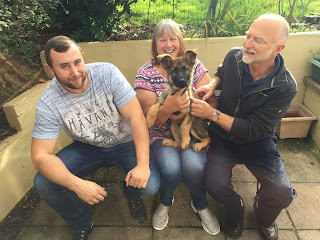 Here is Merlin with our most experienced puppy walkers Lyn and John Parlour and their son Ian. They are regular attenders at all of our training days and have brought Merlin up to an excellent standard in terms of his control, tracking, article searching, person searching and puppy bite work. He regularly swims with Ian. The eagle eyed followers of our blog will know that Kevin licensed in December 2017 with Police dog Devon and are probably wondering why Kevin is on another course. Here is Devon with Kevin and puppy walkers Lyndsay and Anthony at their passing out parade in December 2017. Police dog Devon recently developed a very severe ear infection and although the infection cleared up shortly after this he seemed to lose some confidence and became less than keen to go work with Kevin in the Police van. We are not sure why Devon has had this loss of confidence but all of our trainers who have worked with Devon think he is an excellent dog who will come through this. Lewis to give him time to recuperate and just to have some relaxation time. Andy’s current Police dog Bo is due to retire soon and Andy is hopeful that Devon will return to his normal self and that he will be able to work with him. 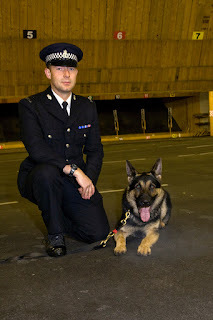 Here is Andy with Devon and his Police dog Bo relaxing and getting on very well together. The advantage of our puppy scheme is we watch the pups grow from such a young age and we know their individual characters. We know that Devon has been a strong character throughout his puppyhood and we are confident this is just a blip and he will soon be back to normal. He has settled in well with Andy and the early signs are very promising. In the meantime Kevin has been allocated Peppe and will complete a new course with him. Peppe was bred by Koos Hassing of Tiekerhook kennels in Holland. I collected him when he was 15 weeks old. He has been puppy walked by Chris Walter and his partner Lyndsey. He is pictured here in the early weeks patiently sitting and waiting while Chris’s son Henry prepares his supper. His puppy walker Chris has done a great job getting Peppe out and about socialising him and preparing him for the next stage of his journey. We always find the pups imported from abroad haven't received the socialisation that they would have done if we had been able to get them at 8 weeks. 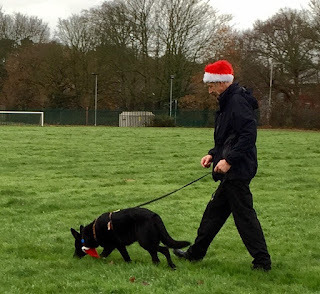 Here is Chris on one of our fortnightly training days playing search games with a canvas dummy he has hidden in the long grass for Peppe to locate. We are unable to collect imported pups until they are 15 weeks old because we have to wait until their rabies injection has fully taken. Puppy walker Chris handed Peppe over to Graham Attwood several months ago so that Graham could prepare him for the Initial course. Chris is now puppy walking a new puppy called Nero. 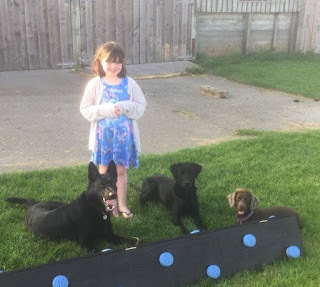 Peppe is pictured here at Graham’s home with his other dogs and his daughter Polly. 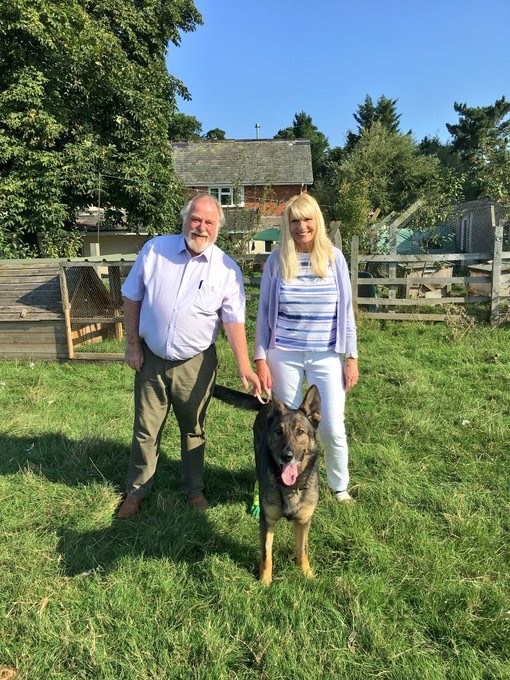 Gunnar was offered to the Alliance dog section by Natasha and Sean Cornwall from Portland to see if he would be suitable as a Police dog. They had raised Gunnar from a puppy but with Sean’s long working hours and Natasha heavily committed with her children and fostering commitments they were just not able to give Gunnar, a very enthusiastic and energetic dog, the stimulus he needed. With our puppy program we haven’t needed to accept a donated dog for many years but I was impressed with his enthusiasm and lovely temperament and so we started him on the course this week. Unfortunately he did find some aspects of the course stressful and so to avoid putting him under any further stress we have released him from the course. We have re-homed him with Andy and Katie who are on our list of people waiting for a released dog. The new owners will be keeping Natasha and Sean updated on his progress. 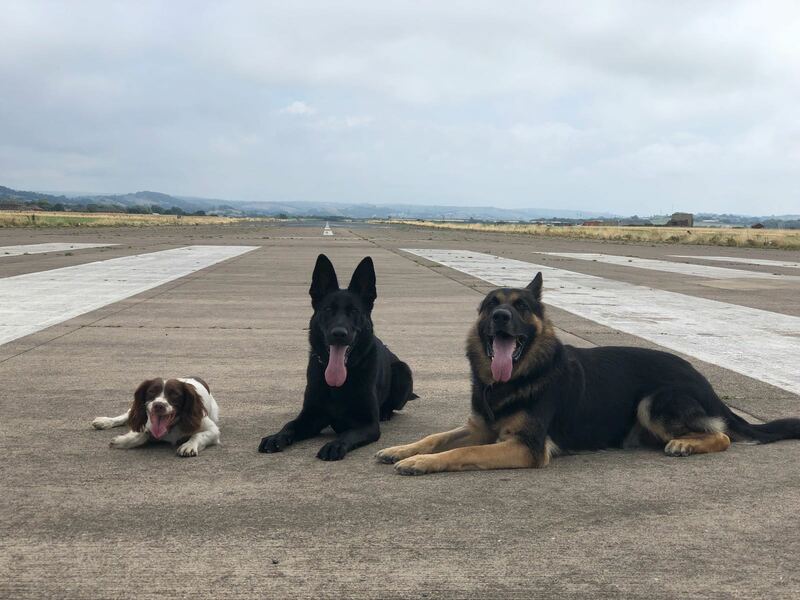 Not successfully completing an Initial Police dog course is no reflection on a dog because before our puppy program was introduced we would often look at up to 30 dogs before finding one that was suitable. As I often say we are not all cut out to be a Royal Marine. I will be doing a mid-course blog and an end of course blog giving an update on how all the teams are getting on and coverage of their licensing assessments and passing out parade.